The WGN outputs very accurate, high quality white Gaussian noise. The output level can be set as Noise Density or Noise Power in a selectable bandwidth. Factory calibration over the entire frequency range yields 0.25 dB absolute accuracy. The noise power can be varied with 0.015 dB resolution over a 95 dB range. 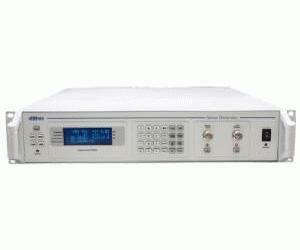 Any user supplied signal can be injected into the instrument to combine with the noise. An optional signal attenuator is available. The instrument utilizes the dBm proprietary microprocessor controlled attenuator with 0.015 dB resolution, providing an extremely accurate output.